The Masters group stage has ended! Almost - we got some ties in the process, so read further on how the scoreboard got evolved over the week. On the Minions level, it comes to the last week to know who the promoted players are - Zaqzorn and lundiz slided into the middle of the table while Dualwarhead got a stream of good matches and popped up into virtual 5th place, with mechANIC closely following him on sixth. Unfortunately, WhoCares went AWOL, and it's yet unclear but highly likely that he won't be able to play the last match against jjkramok, giving Jur additional chance to get the top spot. That is if WhoCares doesn't forfeit the season explicitly, which might lead to Jur and Punsho fighting for the title. Snakes and Ladders early gameplay is all about the oil derricks control. ZxGanon made it look easy with spreading his infantry all over the place and using the numbers superiority to grab just about everything while Unano did a 1ref-wf opening and had light tanks in too late to make a difference. He levelled the field with recapturing one as two were destroyed; the assets disposition was also even at 5min mark, though ZxGanon had better map control which he enforced with a targeted attack onto the middle ore patch coupled with a forward base there, while also deflecting the trio of light tanks with 2 rockets stationed at his main. Control of the map middle turned out to be the key point of the game as Unano couldn't apply enough pressure on the sides to make a difference. The game ended with a multi-side attack of ZxGanon on Unano's main. And then lasted for 2 more minutes. Second game on Stanitsa was the complete repeat of the first one - full ground superiority by ZxGanon with double ref while Unano lost all the infantry and an engineer doing 1ref-wf. Now Unano was faster to grab an expansion as he opted out from building flak trucks, but his forward base was up for a surprise - ZxGanon built a bunch of flamers that killed the oncoming basepush power plant in one salvo. The next powerplant followed the same fate. This stopped the blitz in its early stage; at the same time both players went to the bottom of the map, with ZxGanon being slightly faster on the deploy trigger that allowed him killing Unano's MCV; army exchange was also into ZxGanon's favour, so no he was ahead in assets and potential expansions. Unano acted quickly and grabbed the top-left corner to parry the loss of the bottom ore, but now came ZxGanon with an amassed blob that cleared the whole middle defences and the top expansion refinery from Unano. That was followed by a couple of V2s assaulting the corner; even though some of them were mismicroed into the flame tower, the destruction of the base was only a matter of time. Supposedly realizing this, Unano attacked the bottom and managed to do substantial damage while ZxGanon's V2 force rotated from the top. It did rotate in time and drived Unano off, also buffed by an increasing count of shock troopers as ZxGanon has teched to T3. Unano did manage to raze one more Refinery at the bottom (and there was no MCV, so the economy was bad for ZxGanon). But as at 12min Unano was still not having a Radar Dome even, there was nothing for him to hold the defence against the superior force. First game on the love-and-hate Badger Hills. Both players went a rax skip, with ZxGanon also opting for a kennel, which gave Anjew a some 3-4 seconds advantage on a buildup. Anjew on the other side fielded several light tanks to get the better chances at early pressure; his opponent just racked up ore trucks into MCV. Knowing about the light tanks, ZxGanon of course opted for a safe natural grab, as did Anjew for his first expansion. At this time light tanks paid off a huge deal as Anjew raided his opponent's main base; ZxGanon knew about the attack but still didn't manage to protect 2 power plants and was left low-powered as Anjew's light tanks roamed away with only 1 out of 4 lost. ZxGanon tried an attack at the bottom, but Anjew moved out his third MCV just at the same time and deflected it while tanking a lot of damage with the MCV being put into red zone. Things looked bleak for ZxGanon here, with map control lost, expansion routes uncertain and disadvantage in assets. His last attempt at salvaging the game was to contest the bottom expansion with a walled off tesla and apply pressure with an army on the other side; the base position was overrun by Anjew's troops however, and even as ZxGanon had won the initial engagement top-wise, he didn't stand a chance against Anjew's combined forces in the middle which capitalized the assets advantage into a game win. The follow-up was to be played on Stanitsa. The capturables were split evenly. Anjew did a ref sell and got War Factory earlier; this somewhat backfired though, as the then second refinery placed to the middle-facing ore patch got blocked by an infantry force which led to Anjew mining with 5 ore trucks per single ref. He of course built a pillbox and got the patch back, but some mining time was lost. Capturing ZxGanon's oil derrick was a nice counter for him though, also buffed up by a faster MCV sent to the bottom. Unintentionally, Anjew set the problem for himself there though, because ZxGanon built a second engineer to recap the oil. This engineer played a crucial role in the game by running into Anjew's expansion base unnoticed and capturing the conyard, while Anjew was busy defending against the basepush and driving his own counterattack at ZxGanon's main at the same time. The counter attack dealt a lot of damage though, destroying War Factory and leaving ZxGanon with no tesla support. This is where the engineer came in, and Anjew was left pinned at the right side of the map. Artilleries allowed him to drive the infantry forces of ZxGanon back, and ZxGanon himself also took a breather; this one he could afford of course, controlling more of the map than his opponent. Anjew probably was too defensive and didn't take the opportunity to attack either of ZxGanon's expansions; by that time ZxGanon amassed a double-faction army with Hinds and Artilleries backed up by Flak Trucks. Another mistake with MCV moveout was the last straw. This match didn't seem to be much important, but turned out to be a crucial turning point for the Masters group stage. First game eskimo picked Shared Reponsibility. Early play was more or less even with both players building up to a War Factory and 3rd Refinery (Anjew selling his second though). Eskimo barely missed the engineer with his back-running grenadiers, but still managed to inflict some damage by destroying a Refinery which actually hurt Anjew due to the prior sell; at the same time Anjew's attack failed due to mis-controlled APC that left his army without protection so he didn't bother following up on that. Anjew's basepush that followed there was semi-successful, blocking eskimo from one of the ore patches, but eskimo didn't use it anyway, so it just turned into a standoff; eskimo did expand around the map slightly better and got around Anjew's push into his main to destroy a War Factory. 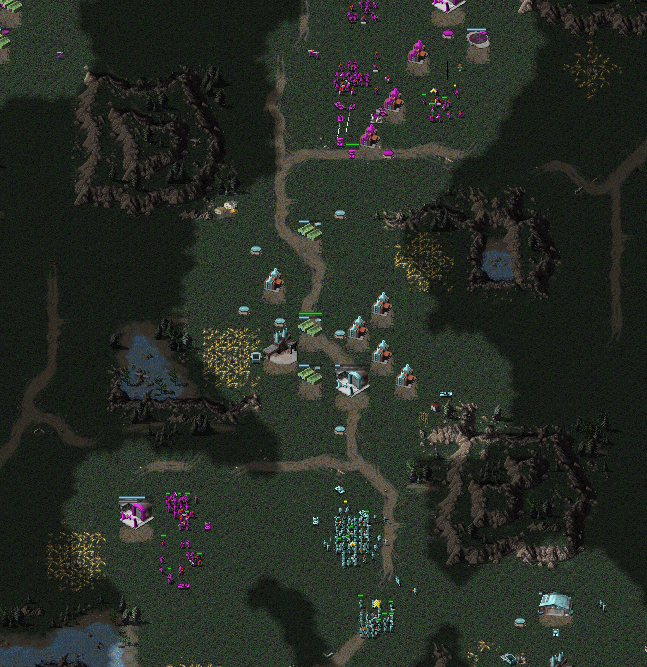 Now the game spread out all over the map with multiple army dispatches attacking unprotected bases. It all looked to come down to who manages to get the better deal out of it. Anjew did have a better army movement around while eskimo chased a non-existant base on the right side and didn't manage to kill a Radar Dome (not that it influenced the game much as Anjew didn't build a single V2). The game was done when Anjew finished off the main base of eskimo. Badger Hills was picked next, supposedly picked by Anjew as he made a strong impression here against ZxGanon. Again Anjew went the greediest build with WF and 2 Refineries before the barracks. This worked even better that in the prior game, as eskimo didn't build up as risky and also didn't opt for any grenadiers (he probably should have). MCV was faster for eskimo, cause again Anjew built 4 light tanks, but those completely missed the MCV in the middle which allowed eskimo to set the base there; light tanks proceeded into the main and killed 3 power plants but didn't put eskimo to low power - he just replenished the power at the expansion. The only positive Anjew brought from this engagement was trading 2 tanks for an ore truck. The game followed with Anjew expanding north and left and eskimo taking the middle and right side. Anjew also managed to drive his MCV into the bottom expansion spot and grabbed a lot of eskimo's attention. Attack from the north followed, and eskimo required to shift all his forces there; Anjew then moved through the south, and eskimo spotted that and answered with a counter-attack on Anjew's Construction Yard. This opened up the middle base once again, and Anjew used the opportunity to clear the middle base while sacrificing the bottom outpost and trading a small army force. Eskimo attemped an attack on the left, but split his army into 2 infantry blobs and a separate tank squad; this was definitely a mistake as the tanks got isolated and killed, and then Anjew just waltzed in with his combined army onto an infantry-only bottom dispatch from eskimo. Left flanking maneuver did produce some profit for eskimo, killing several ore trucks, but Anjew still had enough to get the momentum going; again eskimo's tanks went in without infantry and got destroyed one by one, this time it meant the game because 10 ore trucks by eskimo grazed empty mines and were practically left the only mobile assets for him. Good streak of games by Anjew placed him 4th, so FiveAces needed to score at least a point vs Orb to have a chance at this season's Playoffs. FiveAces vs Anjew tiebreaker best-of-1 will be the actual last game of the Masters group stage. Then it's all up for Playoffs for the next two weeks! Follow the discord and this subforum for announcements, all the info will be announced soon. As for the Minions, seven days left to wrap up the season there, some of action might get into the streams as a livecast. Last edited by netnazgul on Tue Dec 04, 2018 5:50 pm, edited 1 time in total.